At 11:25 a.m. today (Monday), the West Texas Intermediate (WTI) crude oil price was down 1% and trading at $39.08. Futures for the U.S. benchmark have gained 11% so far this month. 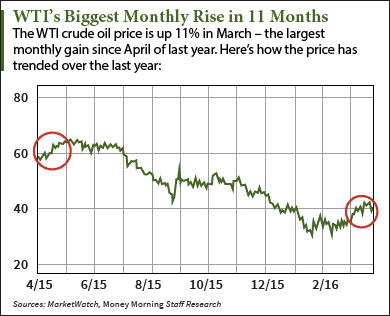 That's the biggest monthly climb since the WTI crude oil price gained 25% last April. The Brent crude oil price was even more volatile this morning. The global benchmark – priced in London – fell 1.4% to $40.45 a barrel. It's currently up 8.6% in March and 0.5% in 2016. With crude oil prices climbing more than 11% in one month, now is the best time to start investing in oil companies. That's why Money Morning Chief Investment Strategist Keith Fitz-Gerald – a seasoned market analyst with more than 30 years of trading experience – recommends an oil stock with an exceptional dividend and upside potential of 20%. The biggest factor pushing the WTI crude oil price higher this month is declining U.S. production. According to the U.S. Energy Information Administration (EIA), total U.S. output was 9.04 million barrels a day for the week ended March 18. That's down 30,000 barrels a day from the prior week and 384,000 barrels from the same week in 2015. This recent production decline is due to the falling U.S. rig count. Baker Hughes Inc. (NYSE: BHI) reported there are 372 active oil rigs as of last week – the lowest count since the week of Nov. 13, 2009. "The U.S. rig count has declined precipitously… that can't help but lead to a drop in supply, especially when it comes to shale or tight oil," said Money Morning Global Energy Strategist Dr. Kent Moors, who has 40 years of experience as an advisor to U.S. and Russian energy agencies. "It's only a matter of time now before we start to see a reduction in supply on the American side of the market." While output is dwindling, overall output is still at record levels. Total U.S. inventories stand at an 80-year high of 532.5 million barrels. That's why Fitz-Gerald has recommended this one specific oil stock. Since this company isn't heavily involved in production, its cash flow isn't directly influenced by excess supply and low prices. In fact, the company raked in $99 billion in revenue last year despite the 36% drop in WTI crude oil prices. One of Fitz-Gerald's favorite oil stocks is Phillips 66 (NYSE: PSX). Phillips processes and refines oil and other petrochemical products. It merged with Conoco to create ConocoPhillips (NYSE: COP) before becoming its own firm in 2012. Most of Phillips' revenue comes from "downstream" services, like refining and chemical production. These services turn oil into consumable products like gasoline and petroleum. Refining is the main source of revenue for oil firms when the WTI crude oil price is below $40. Because gas is always in high demand, inexpensive oil also makes it cheaper for refineries to profitably make more gas. That's one of the reasons why Phillips constantly beats earnings estimates. The firm has beaten EPS expectations for the last six quarters. It also raked in an impressive $99 billion in revenue in 2015. Phillips is one of Fitz-Gerald's top oil picks for one reason – its profitability isn't susceptible to low oil prices. "It doesn't drill for oil or natural gas, which means it's not as vulnerable to sustained low oil and gas prices as other oil companies are," said Fitz-Gerald. Analysts surveyed by Thomson First Call give PSX stock an average one-year price target of $91.83, but have one as high as $105. This high target would be a gain of 19.2% from its last $88.06 close. That's a solid forecast considering revenue is projected to increase 39% to $130 billion this year. PSX's dividend policy is a strong bonus. The company's quarterly dividend has nearly tripled from $0.20 per share to $0.56 over the last four years. As of March 28, it has a 2.5% yield.